Despite weighing 160kg more than its Coupe sibling, the new drop-top takes 0.1 seconds less for its 0 – 100km/h run and has the same top speed of 333km/h! With any Bentley, insane numbers are the usual offering. And the new Grand Tourer is no different. The Continental GT Convertible is powered by a 6.0-litre W12 motor that churns out 626bhp and a colossal 900Nm of torque. The power is sent to all four wheels through a new active AWD setup (replacing the earlier 40:60 power split between the front and rear wheels, respectively) which works in tandem with a ZF eight-speed, dual-clutch automatic gearbox, giving it a 0 – 100km/h time of just 3.8 seconds. For enhanced fuel efficiency, Bentley’s Variable Displacement system shuts down half of the engine under defined conditions. As a result, the engine operates as a six-cylinder motor under lighter loads. As compared to its coupe sibling, the drop-top's profile is longer and lower due to the positioning of the front wheels 135mm further ahead. This has resulted in the convertible having a lower nose. However, the key power lines still dominate both the cars. The lower nose is made even more eye-catching by the crystal-finish LED matrix headlights. The additional weight, which now puts the total gross weight figure at 2,865kg, comes from a new Z-fold roof mechanism, which adds to the refinement and luxury of the car since the new mechanism offers a three-decibel reduction in overall noise. The tailored roof takes 19 seconds to fold or unfold and can be operated at speeds of up to 50km/h. The new Continental GT Convertible also features the 'Bentley Rotating Display' for the driver, which comprises of a 12.3-inch touchscreen housed in a three-sided unit, which revolves to reveal either a touchscreen or three analogue dials. At first glance, there appears to be no screen at the centre of the dashboard. However, once the engine start button is pressed, the veneer rotates to reveal the 12.3-inch MMI touchscreen display. 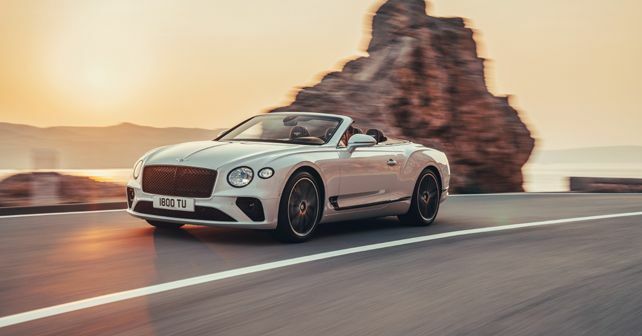 For audiophiles, the Continental GT Convertible will offer three audio system options – a standard 650W 10-speaker setup, a Bang & Olufsen 1,500W 16-speaker system or a Naim 2,200W 18-speaker system with Active Bass Transducers. The new Grand Tourer from Bentley gets 21-inch five tri-spoke wheels as standard, with the option of 10-spoke and 22-inch five open-spoke wheels. These three wheel designs are offered in a selection of ten polished and painted finishes. Sitting behind these wheels is the most powerful braking system ever fitted to a Bentley, with a total of 28 pistons. The 420mm front discs are stopped using ten-piston brake callipers, whereas the rear 380mm singe-piece discs are stopped by four-piston callipers. The car is expected to go on sale in 2019, and deliveries in the UK are slated to begin by mid-2019.